Cloacina was the Roman goddess of sewers, simultaneously the goddess of filth and the goddess of beauty. She is named for cloaca, the Latin for sewer or drain. Remains of a shrine to her can still be today seen in the Forum in Rome, where she watched over the Cloaca Maxima or the Great Sewer. The Romans, who seem never to have had an original religious thought, picked her up from the Etruscans. The Etruscans lived in what today is northern and central Italy. The ancient Romans called these earlier people the Tusci or Etusci, which is why we call their former heartland Tuscany. The Greeks called them the Τυρρηνοι, which led the Romans to call the sea off the west coast of Italy the Tyrrhenian Sea. The origins of the Etruscans are mysterious. Their language seems to be an isolate, with speculation all over the place as to its origins and connections — Minoan, Anatolian, Northeast Caucasian, and beyond. Their language influenced Latin, which borrowed a few of its words, but the Etruscan language was completely replaced by Latin. Studies of DNA and mitochondrial DNA have similarly broad results, suggesting Etruscan origins in Anatolia, the Near East, and Central Europe. The earliest Etruscan inscriptions date from around 700 BC. The Etruscan civilization was assimilated into the Roman Republic in the late 4th century BC, formally ending with the Roman conquest of Volsinii in 264 BC. Etruscan legends, and thus Roman ones, held that Rome was founded by Romulus and Remus. Twin sons of Rhea Silvia and Mars, the god of war, they were abandoned at birth, nurtured by a she-wolf, then adopted by a shepherd. They decided to found a city on the Palatine Hill, starting with Etruscan rituals and then getting into a fight in which Romulus killed Remus. This led to a series of seven kings, starting with Romulus in 753-716 BC. The fifth of these mostly legendary kings was Lucius Tarquinius Priscus, also called Tarquin the Elder. His rule is dated at 616-579 BC. 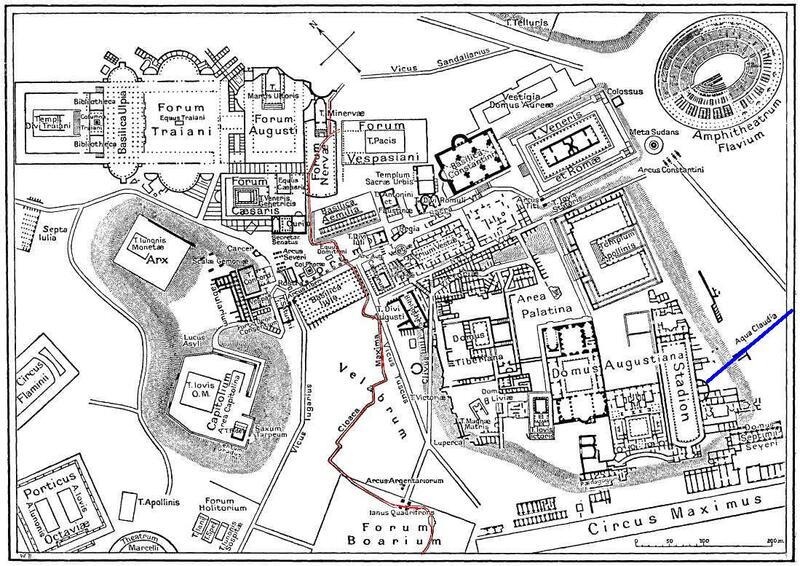 Tarquin is credited with a number of building projects: the Circus Maximus, a stone wall surrounding the city, a temple in honor of Jupiter Optimus Maximus on the Capitoline Hill, and the Cloaca Maxima, the Great Sewer intended to drain the low-lying areas and prevent a repeat of a severe flood of the city. It was originally an open-air canal running through the main Forum area. It collected water from streams coming down from the surrounding hills and emptied into the Tiber river. It came to be built over and enclosed, and some later sections and branches may have been built by tunneling. Ovid's Fasti (VI, 401ff.) preserves Roman tradition about the Forum being built in a swamp-like area. Nil praeter salices cassaque canna fuit. Was nothing but willows and reeds that shook in the wind. Cloacina was a goddess, originally Etruscan but adopted by the Romans, who presided over the cloacas or sewers. Titus Tatius is credited with being a Sabine king who co-ruled with Romulus and who erected a statue honoring Cloacina on the site of the Great Sewer. But... Since the rule of Romulus is traditionally dated to 753-717 BC and that of Lucius Tarquinius Priscus (and thus the sewer's construction) to 616-579, that puts Titus Tatius and his supposed statue about a century ahead of time. There was a Sacrum Cloacina or Sacellum Cloacinae, the Shrine of Venus of the Sewer, on the Forum. The playwright Plautus mentioned the shrine in the early 2nd century BC, in act 4 scene 1 of his play Curculio. At the time it was on the Via Sacra or Holy Road in front of the Tabernae Novae or New Shops. When those were replaced by an expansion of the Basilica Aemilia in 179 BC, the shrine was probably rebuilt. XXII. The Sacellum Cloacinae. A round substructure with a marble rim at the top, and traces of a flight of steps on the west side, have been preserved (see fig. 69). Under the ground a foundation of blocks of tufa to the depth of about 10 ft. has been uncovered. The little structure stands over the drain which flows through the basilica (see above p. 130) not far from the point where the Cloaca Maxima enters the Forum. Upon the denarii of Mussidius Longus (B.C. 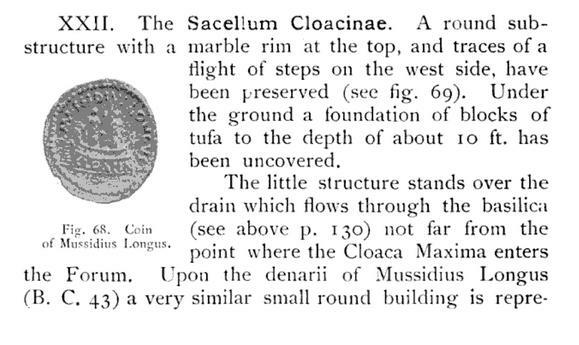 43) a very similar small round building is represented, which according to the inscription is dedicated to Cloacina. 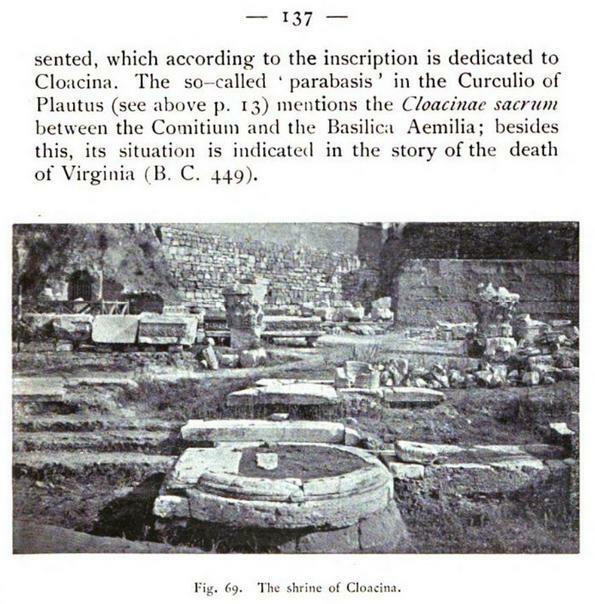 The so-called 'Parabasis' in the Curculio of Plautus (see above p. 13) mentions the Cloacinae sacrum between the Comitium and the Basilica Aemilia; besides this, its situation is indicated in the story of the death of Virginia (B.C. 449). Not rashly swift nor insolently slow. For another toilet-related deity or demon, see the New Testament Toilets for the Babylonian idea of Šulak, the "Lurker of the Latrine" or the "Demon of the Privy". The Romans frequently had a small shrine to Fortuna in their latrines. Derived from the Greek Τύχη (or Tyche), whose name literally means "luck", Fortuna's name led from Latin through French to English and our word fortune. The Romans had plenty to worry about in the latrina — rats and other vermin, swarms of flies, disease, and the always exciting fireball caused by a methane buildup. They could use some good luck, so this was yet another place where a small statue or image of Fortuna was often installed. However, it was just another devotion for luck, there was no special association of Fortuna and the latrines. Fortuna wasn't especially connected to sanitation, but at least the Romans believed in her. Crepitus, an alleged Roman god of flatulence, was entirely made up. Alii ... crepitus ventris pro numinbus habendos esse docuerunt. Others [among the Egyptians] teach that intestinal noise ought to be regarded as a god. The story got out of hand. Tyrannius Rufinus translated the Recognitions from their original Greek into Latin in the late fourth or early fifth century. He spuriously attributed the Greek version it to Clement I, the Bishop of Rome from 88 to 99 AD. Then Robert Burton included Crepitus Ventris or the Flatulence God in a list of classical pagan deities in his 1621 book The Anatomy of Melancholy. That led to Voltaire listing Deus Crepitus among pagan deities in his 1764 Dictionnaire Philosophique. Then Baudelaire, of whom more here, got in on the Crepitus game in his 1852 critique of neopagan artists, L'École Païenne. Finally, Gustave Flaubert made Crepitus a character in his 1849 book The Temptation of Saint Anthony. It references a play by Aristophanes in which the Athenians compare thunder to celestial flatulence. That passage existed in a play by Aristophanes, but that's as close as Crepitus comes to being a classical deity.